to my family, friends, and followers! This blog means more to me than many could ever know! These days, I am blogging regularly about my quilts, crafts, and home decoration forays. This blog has been a therapy of sorts. I intended it to be a place for me to connect. I had just joined the online community world in the summer of 2009 (specifically the BabyCenter Community) when I was frantically searching for information about Thanataphoric Dysplasia, the fatal diagnosis our daughter, Jamie Lynn, was given. When I worked up the nerve to introduce myself to a group of ladies in similar circumstances, the spark that occured was tremendous. Then quilting and sewing became my therapy after my grief. It allowed me to blow steam. I wanted needed to have someone to share my passion. I have scrap booking friends that I go on regular retreats with. The occasions are extremely lovely. I wanted that for my quilting. The response of my friends when I would mention that I loved to sew or quilt were always, "Oh, I have a machine...I just don't know where it is?" "Oh, my husband bought me a machine for Christmas two years ago...it is still in the box". As luck would have it, I found an online sewing group in that same online community. Connections were made. I loved the interaction. I had learned to sew from books and tv shows, but I quickly learned the words tutorial, blogs, bookmarking, and giveaways. I learned that blogs could be a place for me to journal my projects and my progress. A place where I could share any knowledge I had gained in the previous 15 years with others. A place where I could learn from other too! In October 2010, Buttons and Butterflies was created. Thank you for not leaving me all alone. The friendships I have made are tremendous both with my loss followers/friends and my quilt/crafting friends. I love the banter with you. I love the interaction. I love the feedback on a project. I love the motivation. I love that I was inspired to begin my charity Butterfly Kisses by connecting with others. And I love that you all GET it! I cannot wait to run into a few of you at a quilt show. So in order to have a proper thank you post, I am providing a giveaway. These two sweet little fat quarter bundles made by yours truly! These aren't just ANY ordinary bundles. No siree! These bundles are special in so many ways. They are a portion of the first online order of fabrics I ever made. 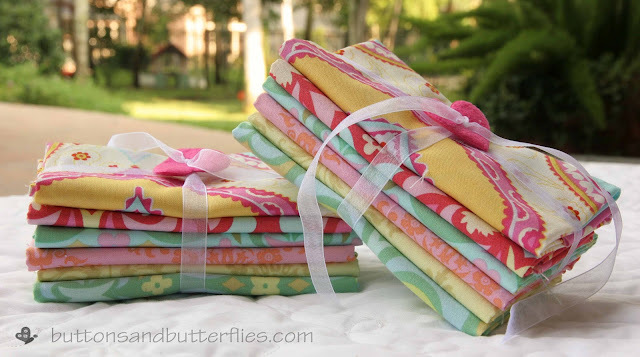 The were the first fabrics that I actually paid attention to the designer of the quilt fabric (Amy Butler and Kumari Gardens). The fabrics are quite coveted by me and have only been cut out for Hartley's quilt and a bee block here or there. This was a momentous occasion for me to cut it for you. In short? They embody so much of who I am as a quilter right now. An online quilt/craft blogger. A growing fabric snob. A recovering from grief mother sharing the only thing she has to offer...herself. And a growing fabric hoarder. Recently, Rachel at Stitched in Color, has been gearing up for a craft show and she discussed her aesthetic or "look". It made me think about all the other blogs I follow and know and love. How I always associate dark wood, bright colors, and intriguing patterns with Rachel. I associate the dichotomy of the complex with the simple with Tracey at Traceyjay quilts...not to mention her gorgeous children, her farm and the fields in the background that her quilts hang in the wind? Makes me want to run barefoot wrapped up in a quilt to go have a picnic in the field! I could go on and on about other bloggers...but you get the picture, right? How to enter? One comment. Answer one or all questions. What do you associate with my blog? What makes you think of me? What is my "look"? Or if I have more than one look...which one should I cultivate? Do you think I should focus more on something and less on others? Do you tire of my personal posts? Oh...and if you are a fairly new follower? Feel free to tell me what made you click "FOLLOW ME"! There is a KEY point I want to make. I am a big girl. I can take it. I made sure I wore my big girl pants today! I really want to hear what you have to say! I am, admittedly, taking complete advantage of you. You are at my mercy and I am not wasting that precious fabric just for a measly "lovely" comment! I think of you when I see butterflies...always. I think your look is classic. I'm not sure why, but your stuff seems timeless, like it will always be in style. I never tire of personal posts. My favorite thing about this blog is that it's real. The successes in projects, the "fails", the fact that you admit to not having started or halfway finishing things, and LIFE. It's all real. Don't change that. Your look to me, modern meets traditional. (I am steeling that from Molly, but it is fitting). I started to follow your blog because I love your projects, but I also love your personal side. You have this strength and beautiful togetherness to your posts, yet I can see a glimpse of your inside. I don't enjoy individuals who bare all to the internet world, but instead are tastefully truthful. You make me want to meet you in real life. Thank you for the beautiful giveaway. I'm not entering because I don't quilt (wish I did), but I think of you and your Jamie because you both amaze and inspire me. I think I read the entire blog that first day, and loved it. I laughed, cryed, learnt, wondered.... I felt there was someone just like me on the other side of my computer screen, and that is what I like about a blog. Getting to know the person behind it. Just like Brandi, not only I think about you when I see a butterfly, but also my kids do. They know about your little girl and what you told your kids about butterflies...and we just love to think all our little angels come to visit us as butterflies. Please don´t change a bit!!! 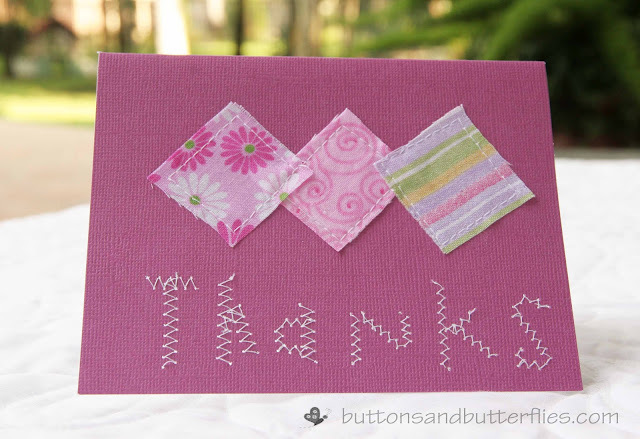 I always think of you as an amazing quilter! and wish I had your skill. I am brand new to trying it - and to be honest have only completed a top and not a whole quilt yet - finishing it scares me. oh and that fabric is GORGEOUS! Heidi, what initially prompted me to follow you was the puffy quilt from last summer. But what has prompted me to move you to the top of my blog reader is really the wonderful balance you strike. I find that my favorite blogs have a good balance of crafting and personal posts/backstory. I find blogs that veer too much into chronicles of the blogger's life don't really appeal to me as much. In contrast, while blogs that are all craft all the time can provide lovely visual inspiration, they feel sometimes like looking at a beautiful catalog; that is, providing eye candy without connection (something I really like about good blogs). The other things that initially kept me coming back to your blog (now I read it voraciously since you're always doing something I find interesting) is the quality of your writing voice and the quality of your photos. I find your writing very engaging. In addition, I feel like you work on all different kinds of projects, so there will always be something interesting to see on your blog, rather than just another project in the same style all the time. Finally, I find your blog warm and inspiring without causing blog envy. I'm not sure if that makes sense, but I think what I mean is that often I look at blogs and think, "oh well, if I were a professional quilter/blogger with no other obligations I could have blogs/quilts/projects that look like that, but that's never going to happen." In contrast, the feeling I get from your blog is more like "well here's an open and engaging lady with regular responsibilities and obligations who's providing high-quality, (not sloppy) content, writing, and design"
Sorry to ramble, but I love your blog and your question prompted me to think about what makes it (and my few other favorites) stand out for me. Keep up the great work and thanks for the sweet giveaway. I really enjoy reading about both your quilting and your boys. The mix of the personal with the quilting keeps me interested and tells me more about you as a person. I love to read about the crafty stuff and I always find I'm inspired to try things because of you. You're modern meets traditional and your writing is light and funny. Your blog posts are easy to ready and I actually read them, versus just skimming and looking at pictures like I do on so many blogs. Why I follow you. Hmm, might be the longest comment ever. You are funny and real. You share your ups and downs. A mom of four - just like me. You have managed to start a business and have your very own long arm - of which I am jealous. I like the quilts that you make. How to describe them? Good colors, easy on the eyes. Simple isn't exactly the right word, perhaps uncluttered? Even though you have a business, you don't blog for your business. I like that you share your sewing and also your family life. I could go on, but I think I'll leave it at that. Well, I just started following you and I am truly inspired by your inspiration! Isn't it funny how you remember your firsts? I was making a scrappy dresden the other day and I found pieces of fabric from my first quilt :) It didn't just remind me of that quilt. It made me think of the people I was around at the time and the person who showed me how to make things with fabric :) Anyway, I wouldn't skimp on the personal stories, they are fun to read too. Thanks for sharing and I am looking forward to more of your posts! I have been a follower for quite some time. I'm pretty sure it started with beautiful quilts that you have made over the past couple of years. No, I do not tire of your personal posts. It is your blog and if you need to get something off your chest for 'total strangers' to pray for you or give you their opinion, then that is what you need to do. I feel if someone doesn't like the 'personal' stuff, then they can just skip that days post. I love your bundles and think of you when I see a butterfly or my jar of buttons. I have you bookmarked and maybe "liked" on Facebook? I have enjoyed your blog (found through BabyCenter) and your babyloss support (I am also involved in babyloss support, so it is close to my heart). Love your mix of modern, traditional, and personal challenges! So maybe I would say your aesthetic is "Constantly pushing the boundaries of modern traditional quilting." When I read your blog, I feel like I am there with you in your ups and downs. I like your mix of modern and traditional quilting. I love our group of babycenter quilters (and now FB) you all keep me going. I never thought I would find such a great group of young women who are into quilting and have such beautiful taste in fabric. I have to say though, I love your boys. If I have more children and they are boys, I want them to look like yours. They are adorable. I hope one day we can all meet up at a quilt show. First of all...that is beautiful fabric! Did your hands shake when you cut into it like mine do when I cut beautiful fabric I'd rather hoard? Secondly...I'm glad you're making us work for it! Hahaha! Here it is...I love the posts about your family, it makes you more real, as if you lived up the street! 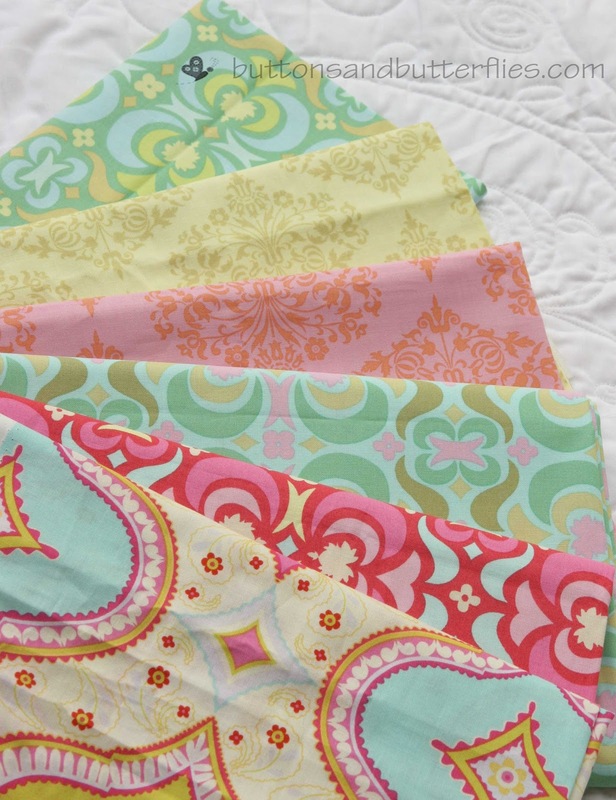 Your blog style is similar to my quilting style, fun, bright prints that are sometimes girly and seasonal, that turn into beautiful quilts! I'm so glad I stumbled upon your tutorial on Moda Bake Shop and the your blog! Thanks for the day brightening posts! When I think of you and your blog what stands out the most to me is your huge giving loving heart. The love you have for your family spills out everywhere and I love that. That is what is lasting and matters most. I love that you are real. There's no putting on a show of some perfect unattainable life. Makes me want to hang out on your patio with some lemonade or sweet tea with you. The love, compassion and empathy you have for others also stands out. You have shared your story with others so that they too are not alone. And above and beyond that you've given so many a special gift that they will treasure always. I love your personal posts as much as your sewing/quilting posts. Whatever look your blog has I'll think the same of you because of it's content. It's so funny that you ask what is your "look," because as soon as I saw the bundle you were giving away, I immediately thought, "That bundle is so Heidi!" So I guess I would say your look is pastel-ish, but yet also bright and colorful, and definitely right at that intersection of traditional and modern, just like the prints you're giving away! I don't think there's anything you should focus on more or less - I think any changes you make depends on your goal. If you want more followers, try doing some tutorials (blocks, etc. ), and just make sure you have a lot of nice pictures. But I love your blog just as it is! And no, I don't get tired of your personal posts! I am a new follower who came to your blog via a link for the lovely giveaway. I became a follower because of your heartfelt post. I am so sorry for your loss. I have a grandson with Alexander's disease. Alexander's is also terminal. I don't know how we will go on when this horrid disease takes him, but knowing that others have gives me the courage to face the future. We are still praying and hoping for a cure. I'm a new follower, and new wannabe quilter! I comb the internet looking for tips, hints and tricks and for sewing practice items, too. I saw your aprons (awesome), joined your blog, and then started looking around (saw the giveaway)! Thanks for the chance! I'm a new follower too and I find your blog clean and fresh. Thanks for sharing. - Clean, interesting blog interface with colors that appeal to me. - Engaging, honest blog content that comes with a lot of meaning. - Your sidebar buttons show that we share common interests. I look forward to following your creative and personal journey. Another new follower here. I came for the giveaway; browsed your blog and enjoyed the quilting and personal posts. I enjoyed what I saw enough to add you to my blog roll. I think your blog looks fresh. I think personal posts are what make blogs. I follow your blog becasue I enjoy the personal bits you put in. Thank you for the chance to win these beautiful fabrics! Thanks for this second chance to win too! Am soooo honored you'd share treasured fabrics with just a brand new follower too...waaaay cool! I came to see the giveaway! I like what I see and I'm now following! I got an e-mail about the giveaway and came to your blog. I am a new follower and will also follow your other blog. I always read the about me section of a blog first and yours compelled me to read further. I read about your precious little girl and was overcome by your grief. There is so much sadness and we all have our own griefs,hopefully, we can find healing though faith and friends. i did look through you projects and posts and it looks as if you have taste very much like mine. I will be visiting often as I will put you in my Google Reader. I especially like the honesty of your post on the other blog about how you are doing. I am at the same place for different reasons. Not many understand this place. Thank you for sharing so openly. Your blog always reminds me of bright and cheery things! I enjoy reading your posts, both personal and otherwise. I'm so sorry for your loss- I'm glad you've found comfort and continue to heal. I am a new follower and enjoy your matter-of-factness. Your blog looks clean, crisp and pretty. I look forward to reading more about you and your life and your sewing - your story is incredible. Amazing where support can be found. I'm a new follower. Your beautiful photo of this lovely fabric drew me in. I am a new follower. What made hit the follow button was that I loved the colors you used in the blog and in the giveaway so I knew that I would love your color choices for projects and I went through some of your older projects and was inspired by them. I think your look seems sweet and carefree. First off I like personal post and I think this is you, you are someone that other people would like to know better, so keep up with the family life. I also think that you are very modern with your quilts (which are lovely by the way) and I need to come back to spend more time in your tutorial pages, I love tutorials in blogs. Truthfully, I just found you because of this giveaway. I love the tutorials you have! I am a new follower, who came to your blog because of the giveaway. But I don't hit the "follow" button for every blogger hosting a wonderful giveaway. I decided to follow you because of your honesty concerning the loss of your daughter. Some people don't experience much loss but for others of us it is part of our everyday lives. My sister lost a son and a daughter and not a day goes by that I don't think of them (and now her, too). There is a comfort level for me in reading a blog written by someone who knows the same world we do. And the only change I would suggest is a slight grammatical one. In your short bio at the top of your blog, I would say you are the mother of a daughter "who" left too soon, not "that". I hope that doesn't sound picky--I think it just honors the relationship a bit more. I was hooked because of your great Butterfly Kisses posts. I've enjoyed seeing how you make many of your own fabric color combos and how you don't just use designer lines in a certain color way. I've learned a lot about long arming from your stories of Ole Betsy which is so interesting. Any one can piece a top, but us quilters enjoy the whole process! And your great family is awesome, you have many blessings to be thankful for! And you are a veteran, icing on the cake! I'm a new follower, but I have to say one of the things I liked best about your blog are the tutorials. I am a beginning quilter, so I'm always excited to find tutorials. I'm new and I came for the tutorials! I especially liked the Spiders and Webs quilt. I was led here by the One Stop Giveaway Shop, so I haven't been around as long as everyone else, but I'm enjoying looking around. I am a new follower. I love reading blogs that are a mix of personal and sewing/crafting stuff. Your blog fits that bill for me. Thanks for the sharing of your talents and thoughts. I see your blog with a look of love, colored with love, mixed with sweetness, quilted with tenderness. I love to learn new things, so tutorials will be great for me. I recently started following your blog because I like what you do with color. You are very good at making your projects look balanced. You are whimsical but not messy. I love that! I am new to sewing. I am entering this contest because I am a stay at home mom with zero fabric budget! Wow! Hope I'm a winner here! I see your blog as love & light, if that makes any sense. And bright & clear. Funny how we associate colours & feelings to people we only "know" through their writing & work. I think of strength & courage when I think about you & what you've been through. (And inspiration as well) Thanks for the chance to win.